Let’s look at these steps in more detail. If you do not need all of this detail, there is an excellent write-up on how to get started with K8S on vSphere found here. There were only a few things I needed to do with the full ISO image. One was to give it more disk space, for cloning and building. I allocated a 100GB VMDK during VM creation. The next thing I did was to login on the console and enable root logins over SSH, and the final item was to enable and start docker. That’s it. Of course, you can also use many other distros if you wish, but I’m getting to like Photon OS for this sort of testing. Make sure it is on the same vSphere environment where you plan to run K8S. 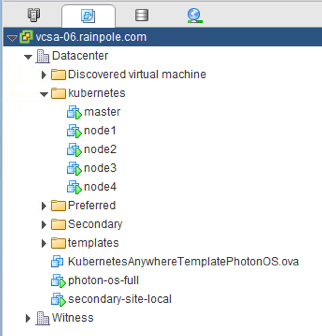 This OVA is another Photon OS image, and will be used to deploy master and node VMs to run Kubernetes. Do not change the name, and do not power it on. Login in to your Photon OS VM, install git with “tdnf install git” and then run a git clone of kubernetes-anywhere. remote: Counting objects: 4092, done. Receiving objects: 100% (4092/4092), 3.97 MiB | 642.00 KiB/s, done. Resolving deltas: 100% (2573/2573), done. Now we build a new container environment for the deployment. This is why docker must be enabled and started on the Photon OS VM. This step takes a long time, and generates a lot of output. I’ve put a few snippets here, so you know what to expect. Although it takes a long time to complete the very first time it is run, it is only a few seconds subsequently to make new environments since the container images have all been downloaded. docker build -t kubernetes-anywhere:v0.0.1 . (1/38) Upgrading musl (1.1.14-r11 -> 1.1.14-r14). This is where you tell “kubernetes-anywhere” that you are deploying against a vSphere environment, and this is where you will fill in the details for the vSphere environment. You will need the IP/FQDN of your vCenter server, plus credentials. You will also need datacenter name, cluster name and datastore name. As you can see from this setup, I an deploying onto a vSAN datastore. The other major difference from the defaults is the phase 2 installer container. Do not pick the default, but instead use the one that we have highlighted here. I have highlighted in red where you will need to change from the default, but obviously these are taken from my setup, so you will have to modify to match your own. In phase 3, the addons, Y (for Yes) is the default, so you can just hit return. make: '.config' is up to date. This is the last step to get K8S deployed. This rolls out the master and node VMs for Kubernetes, and builds the framework. Again, I have included some snippets, but this does take a little time as well, especially the master (which I’ve seen take between 12min and 15min). network_interface.0.label:              "" => "VM Network"
Apply complete! Resources: 19 added, 0 changed, 0 destroyed. The kubectl commands will allow you to figure out which node and port are being used to run the dashboard. You can then open a browser and point to it. The first step is to download “kubectl”, and then point it at your K8S configuration. Now if I point my browser at http://10.27.51.132:31402, I can launch my K8S dashboard. And there you have it – K8S deployed on vSphere with just a handful of steps. Very seamless. Kudos to our vSphere Cloud Provider team who worked very hard to make this happen. ← Storage for containers with VMware? You got it! You can group multiple hosts into a cluster. All hosts contribute to the resource pool. You should still be able to select a cluster if you have created it and added your host to it. In your case, it seems like you may not have a cluster, but just a single host. In this case, the single host is your resource pool. One can also create additional resource pools under cluster for multi-tenancy, each k8s deployment using its own allocated set of resources. Hello Cormac, thank you for the great guide! I was able to get through 90% of it, however when I run make deploy I get this error on the master server only. The other nodes seem to create just fine. Any ideas? I am totally new to K8S so I am getting to a point where I have no idea where to go from here. I don’t Jason, but at the bottom of this github page – https://kubernetes.io/docs/getting-started-guides/vsphere/ – you can submit an issue, and get help from our dev team. Thanks Cormac, I actually figured it out. I did not set the DHCP scope on the Kubernetes VLAN I created, so once I assigned the nodes a static IP, and enabled SSH on all of them, I was able to get the deploy to succeed. Thanks for the reply, and thanks again for the guide! Did you happen to change the name of the OVA when you deployed it in step 2? If so, you need to provide the exact name during the “make config” step. Do you think i need to raise issue on github? Yes – please report it on github. I’ll also try to repro. Cool – so the OVA must be located in a specific place.